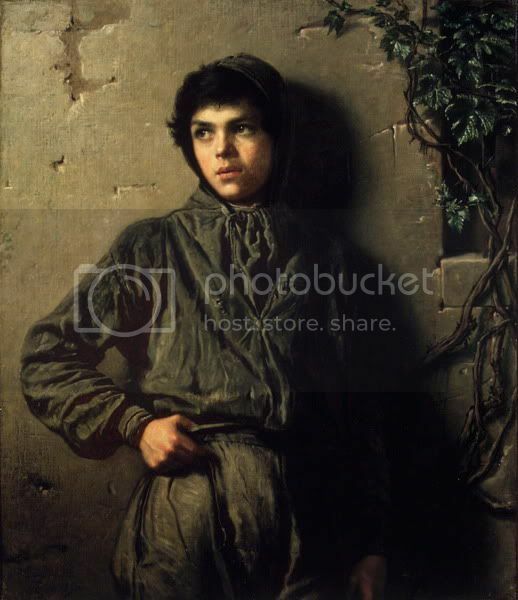 Frodo Art Travesty - The Savoyard Boy, plus jan-u-wine’s “They Say”. It took frodosweetstuff’s invitation to make a post for “Hobbit Month” to tear me away from my on-going screencap series. It wouldn’t do, I decided, simply to post another instalment. I should do something that could be a stand-alone. 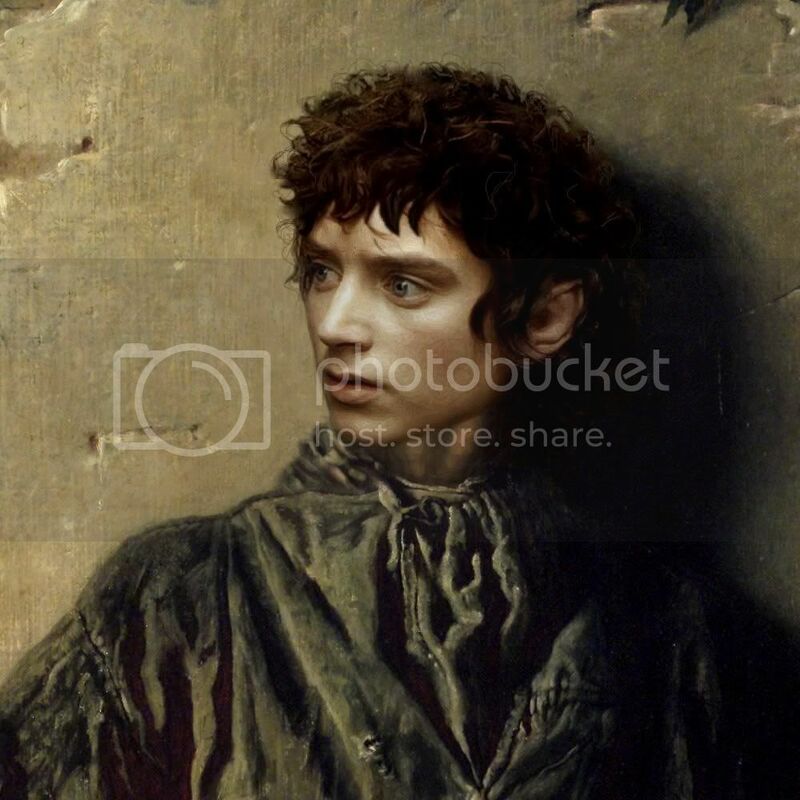 I haven’t made a Frodo Art Travesty since last December. I thought, why not? I was only worried I had forgotten how to do it, but I am very pleased with the results. With the art manip, I am featuring jan-u-wine’s They Say, a narrative poem written from Sam’s point of view as he reflects on Frodo’s condition after their return to the Shire. It will be posted below the manip. This manip is based on a painting by 19th-century American artist Eastman Johnson (1824-1906). Growing up in Augusta, Maine, he mastered the technical skills to render portrait sketches of his hard-working neighbors in crayons and pastels. When he was twenty-one the family moved and he lived for a brief time in Washington, D. C., where his father had taken an assignment with the government. A year later in 1846 he moved to Boston, where for three years he drew such literary and political personalities as Henry Wadsworth Longfellow, Ralph Waldo Emerson, and Charles Sumner. In the fall of 1849, determined to move beyond drawing to painting in oils, he went abroad. The Savoyard Boy was one of his early efforts in oils, but it demonstrates his gifts and skills. Johnson returned to the U.S. in 1856 and painted again for a period in Washington D. C. He even stayed for a while on the north shore of Lake Superior among the native Americans there (my neck of the woods), before returning east. He opened a studio in New York City, and there established a reputation as an academy painter. His genre paintings of the American scene were highly popular, as were his portraits. More on Eastman Johnson's art may be found here. The face comes from a screencap from the EE “Farewell to Rivendell” scene. The different position of the head required most of the "brush work", erasing a good deal of the original model's lovely face, then changing the neck and collar area where the new head sat at a different angle. I am not a very accomplished manip artist in terms of technique. 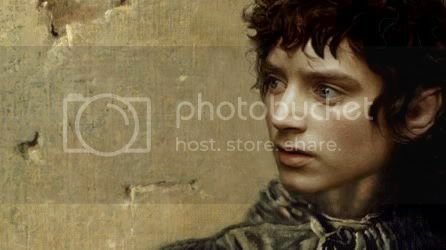 My "art", such as it is, is mostly in selecting the painting and finding a Frodo face that suits it. My idea of a good match is one in which the head and body seem plausible, but, moreover, one in which viewers are drawn more deeply to think about Frodo and his story in new or different ways—according to their own vision—through the medium of seeing him through another artist's perspective. After tweaking the hue and lighting of the various elements so that they match, I finesse the new image into the source painting using the clone and blend tools, selecting areas afterwards to soften, sharpen, darken, lighten, or to adjust the colour. 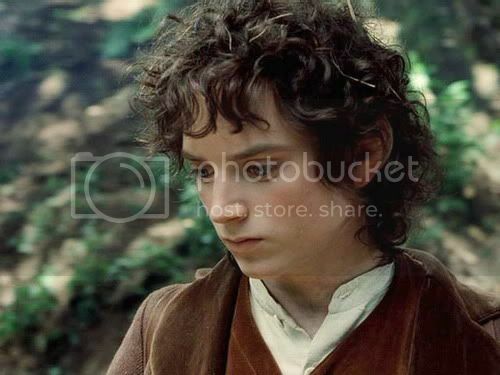 For this manip, because the top of Frodo's head is cropped off in the Rivendell frame, supplementary hair was needed. There was too much of it to draw in and expect it to match convincingly, so I cut out “hair pieces” from screencaps in which Frodo’s head was in a similar position, but with most or all of his hair in view. The finishing curls, wisps, and strands are produced by hand using the clone and blend tools. To produce a better match in texture between the painting's surface and that of the photographic face image, I lightly applied the filter called "pencil: detailed sketch" to the new face, neck and hair. Meaning of the Manip for Me. Studying the manip, I was reminded of several strands of Frodo’s story line, but most of all it spoke to me of Frodo after the Quest, when he had returned to the Shire and realised “there’s no going back” to his old life. Reading the story, it has been (and still is) my impression that although Frodo at first felt euphoric that he and his friends survived, dark things he had experienced did resurface from time to time, more so, perhaps, as his bodily hurts were healed. But I picture the beginning of his marked decline to be when, finally arriving at Rivendell, keen to see his beloved mentor, he finds Bilbo greatly aged and rather disinterested in what he has been through. Frodo girds his loins to this but then suffers his first anniversary illness when they reach the Bruinen. He suffers again as they pass by Weathertop. I have imagined that he found these incidents disturbing, but also portentious. Perhaps he clutched the white gem not only for comfort, but in recognition: this was why Queen Arwen offered him her place on the ship. Even before he saw the despoilation of the Shire, he was probably thinking things wouldn't be "all right”, after all. A Tolkien poem that expresses Frodo’s interior state during his darkest post-Quest moments was published in a collection of verse called The Adventures of Tom Bombadil. Tolkien wrote an amusing preface for the book, posing as its learned editor, writing as if the texts were all archaeological finds of great antiquity which he had thoroughly studied and now was introducing to the reader. The Sea-bell], certainly of hobbit origin, is an exception. It is the latest piece and belongs to the Fourth Age; but it is included here, because a hand has scrawled at its head "Frodos Dreme". That is remarkable, and though the piece is most unlikely to have been written by Frodo himself, the title shows that it was associated with the dark and despairing dreams which visited him in March and October during his last three years. This poem, I think, really was meant by Tolkien to give an impression of what it was like for Frodo during the times of his “dark and despairing dreams”, after he had returned to the Shire. As the Preface's narrator, Tolkien states that the poem is probably not Frodo's own work, but someone (he says) scrawled the title "Frodo's Dreme” on the manuscript—someone who necessarily had access to the manuscript—associating the poem with Frodo and his times of darkness at the anniversaries. Who was "someone"? Sam? Elanor? A descendant who knew all the lore and studied the texts closely? In the published story, Frodo seems to have been able to put up a good front. He was the sort who hated making a fuss, and hated being a burden on his friends. And he was good at hiding things. If there was one thing he learned well on the Quest it was how to conceal his thoughts and feelings from others (lest he betray himself or the mission to enemies). Only at some of the anniversaries does he note he was unable to hide his troubles completely. Unprepared for the March 13 attack at the Cottons', Farmer Cotton finds him lying on his bed in a fitful swoon, obviously suffering. Sam is away, and Merry and Pippin live a long way off. On Oct. 6 Frodo seems a bit odd to Sam, finding him writing in the study, but Frodo believes he maintains his composure, for so he writes. He does not rave or fall into a fever or swoon. The next March 13, Frodo says he carefully and successfully conceals the fit of illness he now expects, because Sam and Rosie are expecting their first child. From the point of view of LotR, Frodo's malaise is nearly completely concealed. But that his suffering was perceived by someone is implied by the fact that “The Sea-bell” came to be attributed to him, even though he did not write it himself. The Sea-bell (aka “Frodo’s Dreme”) is a re-working of one of Tolkien’s earliest verse-tales, the story of Eärendil. Eärendil, half-Elven, sails to Aman to plead for aid, only to find the place deserted. In the version that is The Sea-bell, there is no happy ending, as there was in the tale of Eärendil. No Elvish herald calls the poem's speaker to the feast where his plea will be answered, and aid granted. "Frodo's Dreme" closes in a mood of bleakness that has no foreseeable end. The poem The Sea-bell is quoted in full in this 2006 entry (featuring another Frodo art manip), but for this post I’ll just quote the poem's last stanza. I think this passage best depicts what might have been Frodo's inner state towards the end, or the state he feared he would reach if he did not sail. To return to the "someone" who attributed The Sea-bell to Frodo, the likeliest candidate would be Sam, even if what Sam said was recorded by Elanor or a descendant. Sam could invent light verse; canon shows it. With something serious to say, perhaps he could write something this true and dark. Jan-u-wine is a writer who has helped me see how Sam could have known more about Frodo's illness than Frodo guessed. 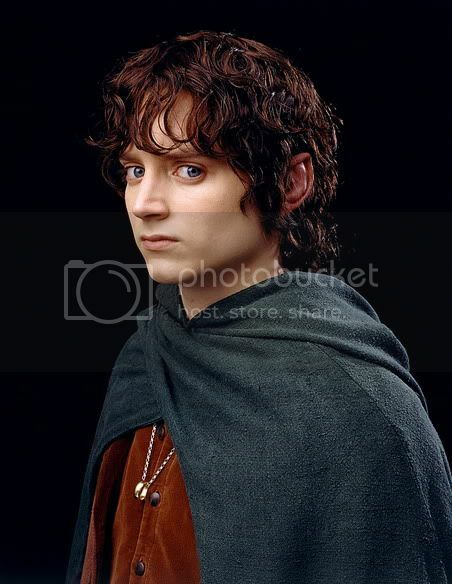 Many fanfic authors have portrayed Sam as knowing more, if not all, about Frodo’s malaise, a malaise often portrayed as so extreme that not only Sam but the entire Shire knows about it. This I find very uncanon. But the way jan-u-wine shows Sam’s knowing makes sense to me within the story Tolkien told. In They Say, Jan shows very well how Sam could know—without letting Frodo know he knows—that Frodo is suffering. That all of Hobbiton seems to know about it could be a projection on Sam's part, so worried is he for his friend and master, but it could reflect reality. If Frodo became glassy-eyed listening to a farmer go on about his sheep-raising woes, the farmer would probably think it a bit rude and off-putting, but not that Frodo was mad. But if all of these people got together at the inn and compared tales, they might decide Mr. Baggins really had gone "a bit queer", like his cousin before him. Besides being plausible, They Say is simply a very moving, deftly-made portrayal of the depth of understanding between these two friends who, together, experienced so much. The discretion they show towards each other seems right, and true to Tolkien's depiction both of hobbits and these particular characters. The emotional modesty makes me love them and respect them all the more. 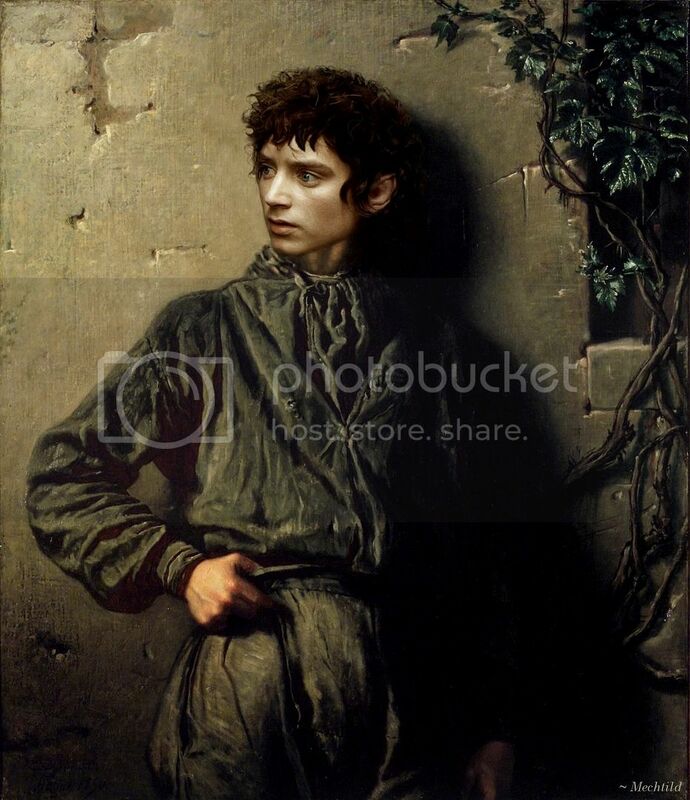 In the manip below I see a too-thin Frodo leaning against a rustic farmhouse wall, as if hoping he might blend in with the scene, appearing to be “just one of the folk”. But his look of ease does not convince, his body slightly stiff, his face agitated and intense. What does he see as he stares? Does his face express the realisation that he is not fooling anyone, that people can sense how cut off he feels from the world that once was his? His clothes are far tattier than anything Rosie or Sam would allow him to wear leaving the house, but I think they enhance the impression of Frodo's inner experience as someone homeless and adrift in a world that seems no longer to know him. The source image for this manip was so large I had to reduce it to post FOR this entry. For those who would like to see the full-size version, click here. Be sure to remember to click it open to see the full image (by hovering the mouse over the lower right-hand corner of the image, then clicking the icon when it appears). Below Jan's poem is a crop of the face and shoulders from the full-size version, just to show the detail. to add to his pain…..
~ Frodo Art Travesty LJ entries (include discussions of the manips). ~ ALBUM of Frodo Art Travesties (images only). 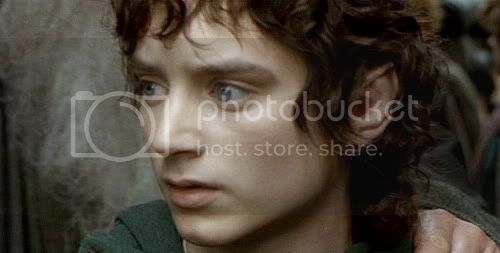 ~ Frodo and Elijah screencaps Main Page of links. Nice work. Oh my, I just want to hug and feed him. Thank you, Mews. It *is* an incredible poem. I am so glad I could post it. Thank you for sharing this for Hobbit Month. Both the manip and the poem are gorgeous and heart-breaking at the same time. I especially appreciate all the background you provide for how you did the manip and what influenced your choices. It is clearly a true labor of love. Yes, the art manips are always labours of love, as are jan-u-wine's poems (I think she channels Frodo). *sigh* But Frodo deserves it, no? : "Gorgeous and heart-breaking at the same time" could describe him, too. Thanks for commenting, Ibilover. This is lovely, Mechtild. Such a beautiful manip, perfectly illustrating Jan-u-wine's poem. Poor Frodo--always trying to blend in, to not be a burden to Sam. And poor Sam--who would have done anything to help him. Thank you for sharing this, dear! You are welcome, Hildigard. I feel really fortunate that the manip and poem could complement each other so well. This is heart-achingly beautiful and sad. I especially appreciate all the background you give us for it! Thank you, Aprilcat. I do love knowing the backstories of things, and about the people who made the things I am reading or looking at. I always assume others will, too, although I imagine I sometimes overwhelm readers who would prefer something sketchier, lol. I appreciate your comment. "but I think they enhance the impression of Frodo's inner experience as someone homeless and adrift in a world that seems no longer to know him." Oh, the face is perfect to portray that! It's just heartbreaking. Poor dear Frodo. Poor dear Sam that he has to witness Frodo going through all this. His heart must have been breaking. Thanks, Primula. I think the poem and image went together really well this time. And I do love things that are both sad and wonderful. I suppose all LotR fans could say that, lol. Both the artwork you made and Jan's poem are wonderful, with so much thought and heart put into them. Thank you for sharing them with us. You are welcome, Starlit! And it's good to see your post. I have been wondering how you were faring. I just spent a couple of hours going back to all the other links where you posted manips. Took forever with dial-up, but was definitely worth it. You did a truly magnificent job. I would be hard pressed to choose a favorite. Oh, dear. You are so right, Yeuxdebleu. I am afraid these posts are the devil for people on dial-up, just as bad as the screencap posts. But I am glad you found them worth the interminable wait. If it becomes too onerous, open the link to the album of manips. Since it leads you to an LJ image gallery, with no attached posts or string of comments, each one comes up much more quickly. If you want to look at a manip more closely, be sure to click it open, then expand it (by hovering the mouse pointer over the lower right hand corner of the opened image, and clicking). If you want to read about the painting, or see the poem or essay that goes with it, alas, you do need to look at the LJ entries. Thank you so much, my dear! It's a gorgeous manip and I'm so glad you posted a new one, I'm a fan of your amazing Frodo Art Travesty entries! Thanks, Melyanna. It's been a while, hasn't it! But I have been totally immersed in going through LotR via the screencap entries. And I can now "see the barn" as they say in English: that is, I am getting near the end of the project, which makes me want to stick with it that much more. Oh Mechtild! I love the new art travesty! It has indeed been too long and now you've returned for Hobbit Month with such an excellent one! I loved to read about how you made the manip and what you see in it! The poem was lovely and goes so very well with the manip. Thank you very much for this great contribution to Hobbit Month! Thank you, Frodosweetstuff, for the comment. And thanks for inviting me to participate. If you hadn't, I wouldn't have broken stride (on the screencaps) to make a new manip. It's been "on the back burner" for months, although I didn't finally choose which face I would use until I worked on it over the weekend. Knowing I wanted to use Jan's poem helped me make my final selection. I love the way they suit each other. Your art truly is in your choices. Such a lovely result, too. He's so beautiful. And the poem by jan-u-wine fits so well. Thank you for sharing your manip. The technique part is facinating, too. Re: Your art truly is in your choices. Thank you, Abandonada. I am glad you enjoyed the post, manip and poem. And I'm glad you liked the technical part. I have always appreciated it when people presenting their manips, or original art work for that matter, tell how they created this or that effect. Gorgeous manip.The dour brownish earth colours, so little life in them, and Frodo doing his utmost to blend right in with them... Yet his face has that clear pale glow as if he's translucent. Such a bright and fragile contrast to the solid wall behind him and to his rough coarse clothing. The poen that accompagnies the manip is sad and filled with much melancholic love steeped in helplessness at changing what is, what will be. That must have been how Sam felt. Yet his face has that clear pale glow as if he's translucent. Such a bright and fragile contrast to the solid wall behind him and to his rough coarse clothing. Isn't that a great effect? And I didn't even do it--it was there in the source screencap from Rivendell. I did experiment with a "diffuse glow" filter to accentuate his face, but I thought it was just right the way it was. I don't like depictions of Frodo glowing like a lamp (in fic or art, unless it is expressionistic), but prefer something subtler, something only those who are attuned to it can pick up. What a beautiful post! I love what you write about Frodo and his painful realization he's never going to recover from his ordeal. The manip is gorgeous indeed, and the explanations very interesting. Thank you! Bagma, thanks so much for reading and commenting, and for the compliment to the manip. I *am* very pleased with it, especially the way it illustrates the poem, and vise-versa.